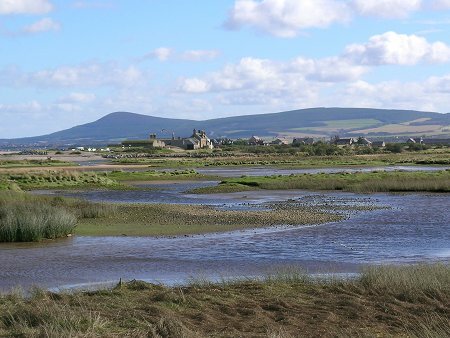 Spey Bay lies on the east side of the mouth of the River Spey as it flows into the Moray Firth. 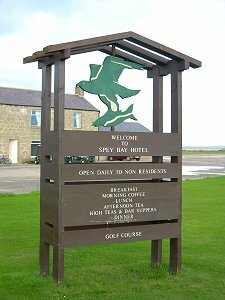 It is a small settlement that is strung out between the old Tugnet Salmon Fishing Station on the river itself, and the Spey Bay Golf Club clubhouse. 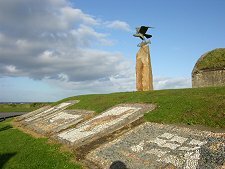 Spey Bay is also where followers of the Speyside Way long distance footpath finally reach the sea and turn along the shore towards the walk's end in Buckpool a few miles to the east. Salmon has probably been fished from the mouth of the River Spey since prehistoric times. But fishing got under way on an organised scale from 1768 when a fishing station was built at Tugnet. Several parts of this remain on view today. The most striking is the Tugnet Ice House. By far the largest ice house in the country, with only a third showing above ground level, this was built in 1830. 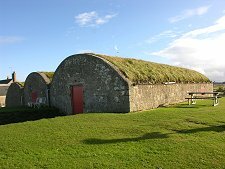 Ice was gathered in winter from specially cut channels in the Spey and stored within the ice house, which was then used to keep the salmon catch fresh until shipping. The rest of the fishing station was based in the nearby buildings. 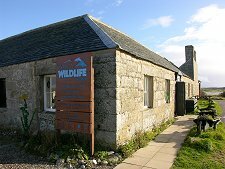 The last salmon was landed at Tugnet in 1991, and since 1997 the fishing station has been converted into the Moray Firth Wildlife Centre, now part of the Whale and Dolphin Conservation Society. While one end of today's Spey Bay began life as a fishing station, the other grew as a golf resort. The Spey Bay golf links were opened in September 1907, when 3,000 people came to watch an exhibition match. The popularity grew further with the building of the grand Richmond and Gordon Hotel. 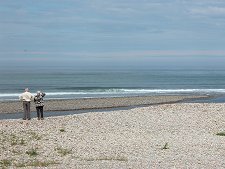 Ideally placed to take advantage of the railway, which crossed the Spey over a metal bridge just to the south of the fishing station, Spey Bay rapidly became the place to be seen for the rich and famous of the day. The railway has long gone, but the metal bridge over the Spey remains in use as a footbridge. The bubble burst for Spey Bay with the onset of WWII, when troops were based in the hotel and an airfield was built just to the south at Nether Dallachy. A period of gentle decline followed, culminating with the burning down of the hotel in 1965. A replacement Spey Bay Hotel grew from the coach houses of the original hotel, but this itself closed and was later demolished to make way for housing development.